Contemporary figurative painting is either a readymade thrill ripe for art-market fetishism, or else it is an art-word pillar, upholding a revered tradition of representation. So then just what is it that makes today’s figurative painting so different, so appealing? 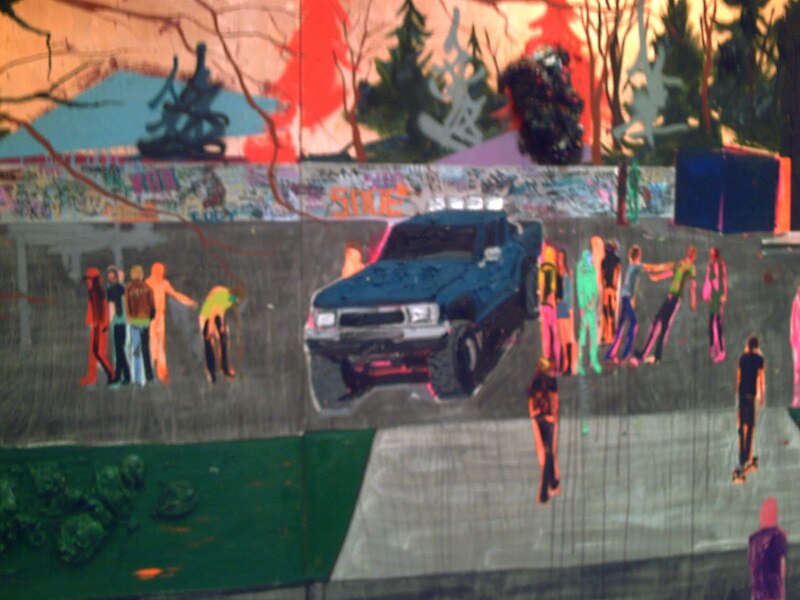 The only thing special about the content of Kim Dorland’s paintings – teenagers hanging out in derelict places – is that it acts as the impetus for the transfiguration of gooey paint. Dorland’s manipulation of paint underlies the structure of his precise forms (cars, a bridge, trees, people) – although they are not photographically exact, they are exacting in their ability to suggest a form’s presence. Dorland thwarts the banality of his own scenes and the homogeneity of contemporary figurative painting with a touch that approaches the alchemical. These paintings embody the pleasure of seeing, as if to see is to feel with the eyes.